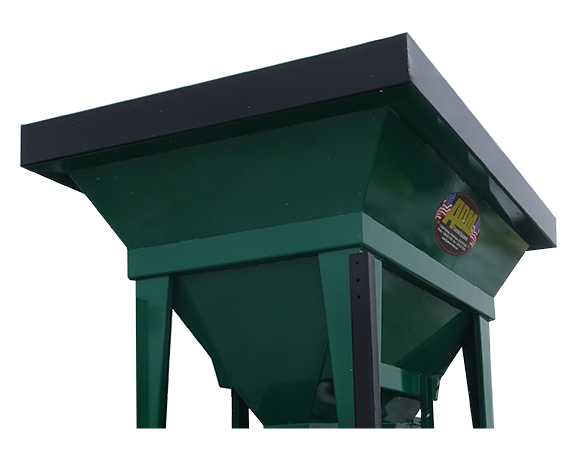 20-ton bin with 12’- 0” wide x 9’- 0” deep top opening accommodates today’s larger loaders. Heavy-duty, angle-iron top rails and mid-section stiffeners add strength and rigid support. Walls fabricated from high strength steel plate provide maximum durability. Steep-sloped sides converge to a tapered, self-relieving opening to provide better material flow. Adjustable, rubber skirt boards minimize aggregate spillage. Multi-position radial discharge gate with positive locking handle sets maximum flow rate.